One of our favourite collaborations this year was Gorillaz and T-Mobiles demonstration of the potential of AR. This beautifully simple application of VR is a true inspiration of just how easy it is to create worlds within worlds. Facebook’s Oculus VR division announced this year all sorted of new and exciting product (hopefully) heading our way in 2018. One of the most compelling was it’s new snazzy dash. By strapping on a pair of Oculus Rift goggles your standard desktop experience becomes a full virtual reality dashboard making you feel like you’re working away in the Avengers’ lab, even if you are just scrolling through buzzfeed articles and stalking your ‘friends’ holiday photos. While the hardware is still someway off the high definition requirement for designers the more casual worker can look to do more than just socialise and play in VR. Netflix personalises Graphic Design just for you! 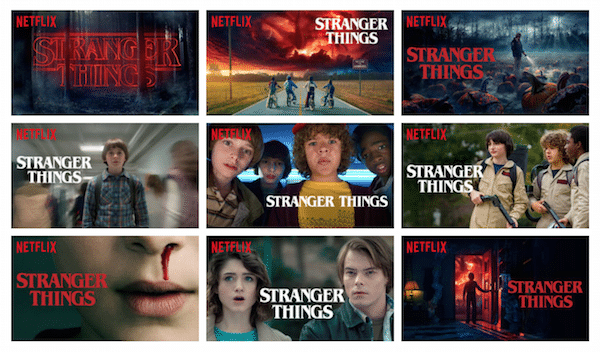 We know that Netflix collects data from the shows we watch to recommend new and exciting entertainment for us, they have now revealed that they take it a step further by personalising the TV/Movie artwork depending on what we have watching and enjoyed in the past. For example those who enjoy romantic films might be interesting in the film Good Will Hunting if it showed Matt Damon and Minnie Driver leaning in for a kiss. How ever those who love comedies will be much more inclined to watch the film if the artwork contains and image of Robbie Williams.